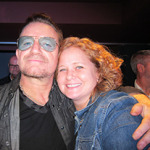 I’ve seen U2 five times in concert on four tours: PopMart in 1997 (Tampa, FL), Elevation in 2001 (Charlotte, NC), Vertigo in 2005 (Charlotte, NC) and 360° in 2009 (Charlottesville, VA, and Raleigh, NC). When I decided to more than double that with about eight more shows on the second 2011 U.S. leg of the 360° tour, I decided it was time to blog. I’m still figuring it all out, but I’ve had some outstanding help getting me set up. Katie Campbell is a bigger rock star than Bono. She did the illustrated logo for bethandbono.com and brought to life an idea I could barely articulate through my rambling emails. I knew I wanted a ‘90s Fly-era Bono, because that’s when I became a fan and that’s the Bono I’ll always be most nostalgic for. Katie and I have never met in person, despite having several good mutual friends and even going to the same small art school. But I think she captured both Beth and Bono perfectly. Especially Bono. The hair — head, stubble and chest! — is my favorite. And I asked her to include his red star patch from his Vertigo-era jacket, because that’s when I did general admission for the first time (which created the monster I’ve become), and that’s what he was wearing when he emerged on the catwalk just a few feet from me. Then she had the brilliant idea to replicate the Achtung Baby logo in the bethandbono.com type treatment. So, thank you, Katie, for getting me the closest to Bono I’ve managed to come so far! (And thank you, Larry D., for recommending her!) You can see more of her awesome work at campkatie.com. And playing The Edge to my Bono (or vice versa, probably) has been Daniel Vitter. A co-worker and good friend of mine, he’s helped me with the technical challenges of getting the blog off the ground, and given up lots of good drinking time to mess around with my themes and widgets and shortcodes. Thanks, DV … I have a feeling a T-shirt is coming your way! And what really motivated me to even pursue this (both the blog and the U2011 summer) are the incredible friends I made in the GA line at the Charlottesville show in 2009. Irena, you are my goal-is-soulmate and most of what I will write in this blog I’ve already said to you. Tim C, you make me want to be a better fan. And Jennifer, your encouraging, sweet comments on a year’s worth of Facebook posts helped get me closer to actually wanting to do this. I can’t wait to spend more long, uncomfortable nights in GA lines with you guys!